To what extent did the AKP use their grip on the Turkish media to frame the November 2015 election in Turkey as a choice between stability and chaos? This paper will explore how much political parties in government are able to use their influence on the media to influence the electorate. The selected case study is the 2015 snap election in Turkey, a country where the ruling party has established a tight grip on the media through a culture of intimidation, prosecution, and restrictions on freedom of expression (Egin, 2013). While there may be other means by which the AKP were able to use the media to influence the election, this paper will specifically analyse the extent to which the frames used by the ruling party in their electoral communications were repeated by the print media, and consider the potential consequences for democracy. In June 2015, Turkey’s general election resulted in a hung parliament, the first time the Justice and Development Party (AKP) had not won an outright majority since coming to power in 2002. After months of meetings in which nation-wide violence flared and no coalition could be formed, a snap election was held in November 2015. In it, the AKP increased their share of the vote from 40.9% to 49.5%, and their share of the seats from 258 to 317 (out of a total 550) (Bardakçi 2016). They won votes from those that had previously supported the nationalist (MHP) and Kurdish (HDP) parties (see Appendix I). This is a useful case study as it offers a clear example of a campaign period significantly impacting upon the outcome of an election, with a direct comparison available between the pre- and post- campaign results. In order to analyse the influence of the AKP on the media in Turkey, this study will include content analysis of two newspapers in the final two-week period before the November 1 election. The newspapers selected are the English versions of two of those monitored by the OSCE Office for Democratic Institutions and Human Rights (OSCE/ODIHR) Limited Election Observation Mission (LEOM) during the election in question. This paper will build on their analyses by evaluating the available politics articles from these papers in this time period for use of the ‘stability or chaos’ frame. 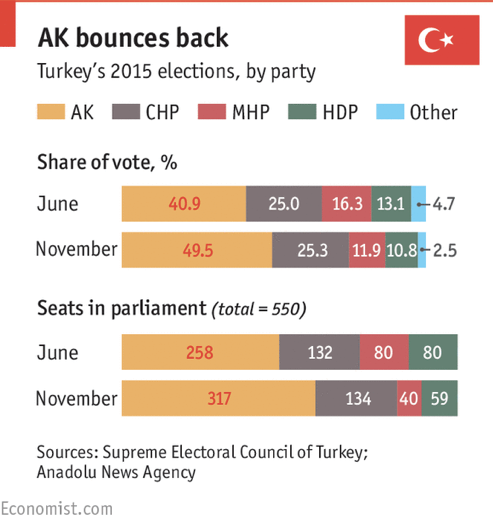 My thesis is that having suffered an unexpected electoral defeat in the first general election of 2015, the AKP were able to manipulate the electorate into handing them back a clear parliamentary majority partly through using their influence on the Turkish media to lend authority to their framing of the election as a choice between stability and chaos. This study broadens our understanding of political communication by shedding light on the dynamics by which a tight grip on the media can impact upon democracy. The essay will begin with a review of relevant literature around framing in the political and electoral context, as well as a brief look at the relationship between the Turkish media and its government. This literature will then be developed into an analytical framework, followed by a more in depth introduction to the selected case study, and analysis results. It will conclude with the implications of this research for the wider field of political communication. Framing is a device that is commonly used in political communication, although scholars differ in their definitions. It is linked to priming and agenda-setting theory, and while there has been a tendency to group the three, Scheufele (2000) argues that they should be explicated from one another and studied separately. For while agenda-setting may tell us what to think about, framing tells us how to think about it (Ghanem, 1997). Entman (1993: 52), meanwhile, writes that frames have four functions; to define problems, diagnose causes, make moral judgements, and suggest remedies. The definition this paper is based upon is that set out by Fairhurst and Sarr in The Art of Framing (1996). They define framing as the ability to shape the meaning of a subject by asserting that one interpretation should be taken as real, over other possible interpretations. They identify five key language tools used in framing; metaphor, jargon/catchphrases, spin, contrast, and stories. This provides a practical interpretation of the concept which can be meaningfully used to identify frames present within texts. Some claim that framing is a concept that has a psychological and a sociological pedigree (Iyengar and Simon 1993). Psychologists use framing to refer to changes in judgement made in response to a change in judgement choices, deriving from Kahemahn (1982). Whereas the sociological definition stems from the work of Bateson (1972) and Goffman (1974), focusing more on the use of storylines, symbols and stereotypes in media content (Iyengar and Simon 1993). Scheufele (2000) points to attribution theory as the theoretical basis for the concept of framing with Iyengar (1991) explaining it as how people try to make sense of political issues by reducing them to questions of responsibility. This responsibility can be divided into causal responsibility; focusing on who caused the problem, and treatment responsibility; who has the power to deal with it (Iyengar 1991, Iyengar and Simon 1993) and will be a key factor in this paper’s analytical framework. However, there have been challenges to the notion of attribution theory as the theoretical basis for framing, with Nelson et al. (1997) theorizing that the psychological foundation of framing relates to how the media shifts the belief importance of an issue, which fits in with more recent ‘active audience’ theories. When considering how framing is employed in competitive political debate, Chong and Druckman (2007: 639) identify two hypotheses found in the literature on the influence of frames over public opinion. First, whichever frame is the ‘loudest’ (most often repeated) will have the greatest influence. Second, that it is in fact the strongest frame which will exert the greatest influence, regardless of repetition, concluding that it is the quality of the frame that is more important. However, Gitlin, also emphasized the repetitive nature of the framing process, writing “Media frames are persistent patterns of cognition, interpretation and presentation, of selection, emphasis and exclusion, by which symbol handlers routinely organize discourse, whether verbal or visual” (1980: 7). Beside literature on framing, the other literature that is worth briefly considering is that which examines the media system in Turkey and the relationship between the government and media; as this provides the background context to this case study. In other words, in order to show to what extent the AKP used its grip on the media to influence an election, it is first necessary to show what type of grip it had. Writing in 2015, Irak (2016) describes the situation in Turkey as “the first time after the single-party regime of the 1930s, [that] the government has its “own” media, the function of which is to support the political party in power at all costs.” He states that while scholars once considered Turkey’s media system to follow what Hallin and Mancini (2007) termed the Mediterranean or polarized pluralist model, this pluralism weakened following the 1980 coup. Kurban and Elmas (2012) argue that the media in Turkey has never fulfilled its role as government watchdog. Instead, they argue that an already restricted media has simply been muzzled further. Bayran (2011) suggests that political parallelism in the Turkish press is somewhere between Hallin and Mancini’s North European and Mediterranean classifications. Meanwhile. Yesil (2014) finds that Turkey has a vibrant media landscape with “40 national and 2,000 local newspapers, dozens of news magazines, at least 10 national news channels, 250 local TV channels, 2,000 radio outlets, and hundreds of news websites”. In this type of media system, it might be expected that the government would not have so much influence. Indeed, Semetko & Mandelli (1997) write that the more commercialized a broadcasting system is, the less opportunities there are for political parties to exert direct influence over them. Yet Turkey seems to buck this trend; despite having a very commercial broadcast and print media, the governing party retains the type of control one might expect to encounter in more public media. The analytical framework used in the following analysis is developed out of Schefele’s identification of attribution theory as the basis for framing, and Iyengar’s explanation of framing as a way of making sense of political issues by reducing them to questions of responsibility. It will be used to analyse how the AKP sought to assign causal responsibility to the newly successful Kurdish political party, the People’s Democratic Party (HDP) (along with, to a lesser extent, the other opposition parties) while positioning themselves as possessing treatment responsibility to counter the rise in violence and instability. In order to analyse the presence of these frames in the media, this study will seek to identify the frames that occur in any of the five linguistic forms highlighted by Fairhurst and Sarr (1996) that attribute causal responsibility to the Kurds (or other parties) and treatment responsibility to the AKP in line with the latter’s framing of the election as a choice between stability or chaos. During the 2015 snap election campaign, the AKP’s campaign slogan (the equivalent of catchphrase in the terms of Sarr and Fairhurst) was ‘Vote For Stability’, and their manifesto was entitled ‘Turkey’s Roadmap with Peace and Stability’. Throughout the campaign, they sought to assert that the only chance for stability was to re-establish the AKP’s majority in government (Bardakçi, 2016). The implication was that anything else would result in economic and national security chaos (Kalaycioğlu, 2016), and that this was the result of the other parties’ actions, or lack thereof. This was clearly laid out in a tweet by a high-ranking AKP deputy who, on the night of the June election, wrote “Yes, the election is over. The people have decided. I said ‘Either peace or chaos,’ and the people have elected chaos. May it bring happiness.” (Berlinski & Altparmak 2015). It was reinforced by a front page headline in August 2015 in a pro-government newspaper which simply splashed ‘Stability Or Chaos’ in reference to the election. It was also a frame used time and again in the AKP’s speeches and political rallies, such as a speech given by President Erdogan in August, in which he stated “I believe that 1 November will be an election of stability or instability, God willing, this country will reach stability again.” (Ibrahim, 2015). In the years that the AKP have been in power, there has been a considerable shift towards a less plural media with more biased coverage, due to a concerted effort by Erdogan and his party (Egin, 2013, Yesil, 2014). The continuing pressure of penalties, audits, and seizures (Egin 2013, Irak 2016) have created a more submissive press, one in which anti-government journalists are routinely fired and which, in 2015, was ranked by Reporters Without Borders as 149th out of 180 in the world press freedom index (Reporters Without Borders). In 2015, it also ranked third highest in the world for the number of journalists in jail (Committee to Protect Journalists), largely due to prosecutions brought against them for criticising the government. This pressure mounted following the 2013 Gezi Park protests in which citizens expressed a level of discontent with the president and government that had not been previously seen (Egin 2013). The crackdown on independent media intensified and continues unabated to this day. Just one week before the 1 November election, one of Turkey’s largest media groups (Koza Ipek) was seized by the government, and two of the newspapers it owned subsequently were passed into the hands of pro-AKP business ventures. In recent years, this has become a common practice in Turkey, the resultant media outlets becoming known as ‘pool media’. This term refers to media outlets that have been seized by a government-affiliated body due to financial difficulty and then bought by pooling funds by pro-government businesses, who subsequently land large government contracts, in what Irak (2016) refers to as “formalizing traditional networks by integrating them into state organization”. In order to analyse the reproduction of frames by pro-government media this study will employ qualitative content analysis to contrast the domestic political coverage in a ‘pool media’ newspaper with an opposition newspaper in the final two weeks before the election. The two newspapers selected are the Hürriyet Daily News and the Daily Sabah. These are the English language versions of the top two newspapers with the highest nationwide circulation (Gazeticiler). The English language versions of newspapers in Turkey contain many directly translated articles and share the same political leanings as their counterparts. They also offer ease of analysis without the need for translation. Another reason for their selection is the fact that they were two of the newspapers monitored by the OSCE/ODIHR LEOM. The OSCE analysis offers useful insight into the amount of coverage given to each party and the type of coverage this was. The mission also monitored two other newspapers; Zaman and Sözçü. Analysis of these newspapers has not been included for the following reasons. Zaman (and the English version, Today’s Zaman) was seized by the Turkish government in early 2016. Accused of having links to a terror organisation, the editorial team and management were replaced by pro-government supporters. The online archive was subsequently erased from the internet, making it difficult to find the same quantity of articles from this time period. Sözçü is probably one of the most staunchly anti-government newspapers and, although very popular, not so representative of the broad spectrum of Turkish media as the more moderate newspapers selected. It also does not have an English version, adding the extra complexity of translation. 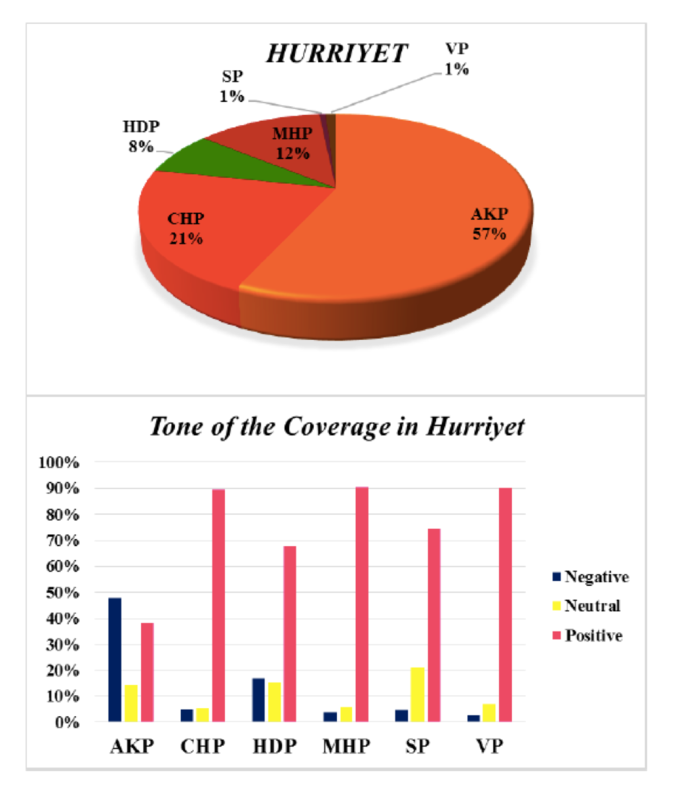 The Hürriyet gave 57 percent of its coverage to the AKP of which 52 percent was positive or neutral and 48 percent was negative. 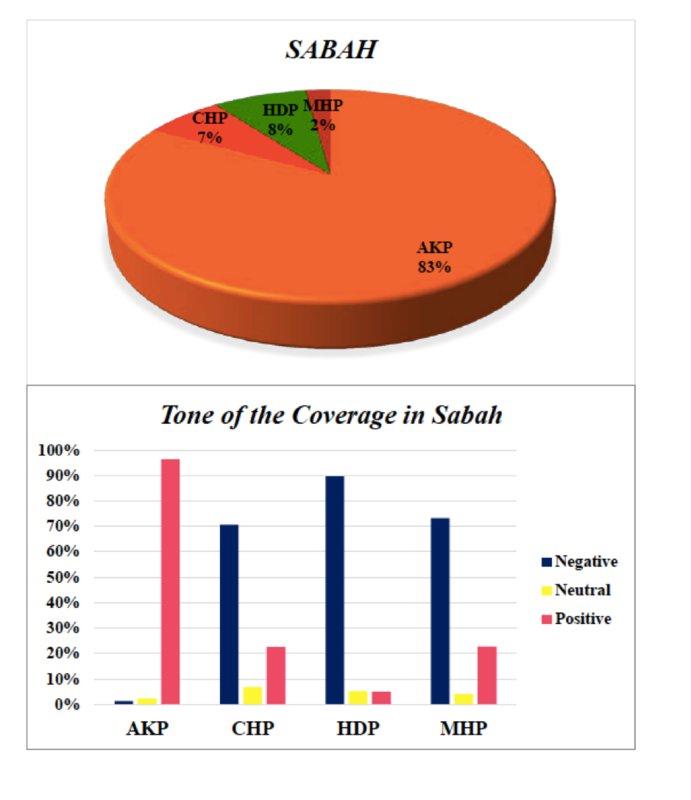 The Sabah gave 83 percent of its coverage to AKP of which 99 percent was positive (see Appendix II.) Although the report also covers TV stations, due to time constraints, this study will only focus on the newspapers mentioned. However, a study into television coverage of the same period would provide further insight. Of the two newspapers that this essay analyses, the Hürriyet is regarded as a mid-market newspaper and one of the remaining independent media outlets in Turkey. The Daily Sabah falls under the category that has been termed ‘pool media’ mentioned above as it was “seized by the TMSF [Turkey’s fund management and insurance in the Turkish banking system governing body] in 2007 and sold in 2008, to Çalık Holdings, the CEO of which is Berat Albayrak, Recep Tayyip Erdoğan’s son-in-law” (Irak, 2016). There are six of the country’s top fifteen newspapers that fall into this category. They all tend to follow a similar format and reproduce similar content with a combined circulation making up around 25% of the Turkish daily market (Irak, 2016). In order to analyse to what extent the government were able to use sympathetic media as an election tool, the final two weeks of politics articles published in the online, English versions of Sabah and Hürriyet were examined for linguistic framing mechanisms as identified by Sarr and Fairhurst (1996), which attributed causal or treatment responsibility that fit into the AKP’s frame of stability vs chaos. In other words, that chaos was caused by the Kurds, other political parties, or the failure of the electorate to elect the AKP with an overall majority, and that the treatment for this was the re-election of a single party government (the AKP), which would bring about stability in both the economic and security sense. These frames were then further analysed to identify whether they were attributed to politicians, experts or journalists, as well as for who the blame for the chaos was laid upon. For the time period covered, there were 56 politics articles found online on the Hürriyet Daily News website and 50 on the Daily Sabah. The results of the qualitative content analysis (seen in Appendix III) show that while 11 percent of the Hürriyet articles contained a recognisable frame that alluded to the choice between stability or chaos, 24 percent of the articles in the Sabah contained them. This is quite a significant difference, and was in part because the Hürriyet articles tended to cover a far wider range of issues. Some of these articles contained more than one instance of framing, making a total of nineteen references in the Sabah articles and just seven in the Hürriyet. They sometime were explicit in their terms, for example when the AKP’s slogan was included as in in article S1; “Prime Minister Ahmet Davutoğlu called on people to vote for stability and a strong single-party government”. However, they mostly occurred in the form of spin, for example, in H24 which included the sentence “The Nov. 1 snap election is the key to getting Turkey out of the instability and insecurity it was dragged into after the June 7 election, President Recep Tayyip Erdoğan has argued”. Another major difference between the papers is that while in the Hürriyet, six out of the seven times this frame occurred was when the journalist was in reported speech by an AKP representative, in the Sabah, the frame could be attributed seven times to AKP representatives, four times to experts, once to a civilian and another seven times it appeared in the journalists’ own words. It is worth noting that these were not columns or opinion pieces, but appeared in the newspapers as news articles. In the Hürriyet, the only time that the frame occurred when it wasn’t reported AKP speech was when, in article H1, a journalist wrote that “Erdoğan’s rhetoric favoring a single-party government’s rule for “stability” has been consistent over the last five months”, making it clear that the journalist recognised it as rhetoric rather than accepted it as fact. The way this was presented was markedly different to the Sabah which, for example, in article S7 ran with a headline “Stability trumps chaos, Turkish voters to opt for single-party government” when reporting on a panel of political scientists discussing the election, ahead of it actually taking place. This inclusion of expert sources (academics, political scientists, etc.) who reiterated the stability versus chaos frame was a feature that appeared in the Sabah but did not in the Hürriyet. Another example of this is in article S29, which was written as a rebuff to an Economist piece that urged Turks to vote against the AKP. A political scientist was quoted as saying “a large part of the electorate are also hoping for a return to a single party government for the sake of stability”. In this same article the journalist writes “Even though the magazine accuses Erdogan of enflaming the fighting between Turkey and the PKK terrorist organization and ending the peace process, the reality is quite the opposite”. There is no sense of objectivity included here. Additionally, in the Hürriyet, there were two occurrences of the paper reporting an opposition party reversing the AKP’s framing of the situation, blaming them for the chaos Turkey found itself in, with articles featuring the following headlines in article H36: “MHP warns of ‘chaos under single-party AKP rule after Nov. 1” and H56: “AKP is the source of instability in Turkey: MHP Head”. In these instances, the Hürriyet reported on the attempt by the opposition to use the AKP’s slogan against them – something that was not covered in the Sabah. These results suggest that, as one would expect, the pro-government newspaper gives a greater platform to the AKP than the opposition paper does. However, the results indicate that the newspaper goes beyond favourable (and more plentiful) coverage, and could be seen to be serving as an additional campaign tool. The AKP’s framing of the political situation in Turkey is not just reported as the AKP’s interpretation of events, but instead is reported as a more objective truth. Journalists refer to it without questioning, experts are brought in to back it up, and it is repeated again and again. Of course, by only analysing the media, what this study does not show is the effect this kind of frame repetition can have on the audience. In order to understand the impact, further research would have to be done on readers of both papers and their understanding of the political situation and electoral choice. Price and Zaller (1993) questioned the causal link between reading newspapers and learning about issues, but Druckman (2005) found that newspapers do “play a significant role informing the electorate”. Given that, sixty percent of Turkish people don’t read a newspaper regularly but ninety percent watch television daily (Kurban and Elmas 2016), a complementary study on the repetition of these frames in television news coverage during the same period could provide additional insight. However, the assumption of the impact of the media does point to a media effects model of audience reception, suggesting that these frames will be transmitted to the reader and accepted without question. Active audience theorists would question the impact of this framing on voter choice. Another alternative reading of this case study could be simply that it proves that press plurality exists in Turkey, that the Sabah expresses one version of reality and opposition papers supportive of other parties present alternative views. However, with the growing rise in ‘pool media’, the line between press and government is blurring and formulaic newspapers are all pushing the same AKP line. In order to research this link further, additional research should be done into the state broadcaster, TRT, and other AKP-linked television channels to identify whether a similar pattern exists there. Television has a much wider reach, than the press in Turkey, so research into this area could be increase our understanding of this issue. Additionally, research into the effects of media on voter preferences would reveal whether audiences were accepting what they read, resisting it, or negotiating it in some way. While there were undoubtedly other factors that influenced the electorate into voting for the AKP, the media can certainly be seen to share some of the responsibility. In the case of the pool media, as represented here by Sabah, this goes beyond mere supportive stance to show very clear signs of bias. This is no longer a question about who sets the agenda, as might be the case with an objective media, but about how a party can gain control over the media and then use it as a mouthpiece for the campaign. Fairhurst, G and Sarr, R. (1996). The Art of Framing: Managing the Language of Leadership. San Francisco : Jossey Bass. Ghanem, S. (1997) Filling in the Tapestry: The Second Level of Agenda Setting. In McCombs, M., Shaw, D. & Weaver, D. (eds) Communication and Democracy. London : Lawrence Erlbaum Associates, Inc.
Iyengar, S. and Simon, A. (1993). News Coverage of the Gulf Crisis and Public Opinion. Communication Research, Vol. 20, Issue 3, pp. 365 – 383. Nelson, T. Oxley, Z., and Clawson, R. (1997) Toward a Psychology of Framing Effects. Political Behavior, Vol. 19, No. 3, pp. 221-246. Semetko, H. & Mandelli, A. (1997) Setting the Agenda for Cross-National Research: Bringing Values Into the Concept. In McCombs, M., Shaw, D. & Weaver, D. (eds) Communication and Democracy. London : Lawrence Erlbaum Associates, Inc.